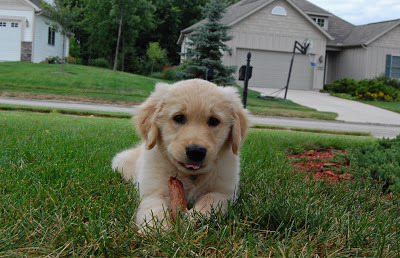 Wrigley loves to chew on stuff….all the time. 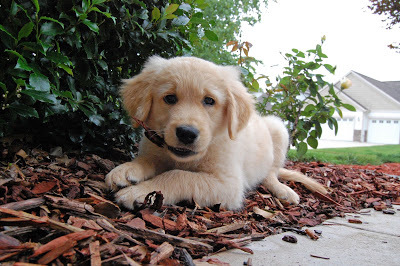 Whenever we go outside he manages to find something to nibble on. You name it, he chews it! 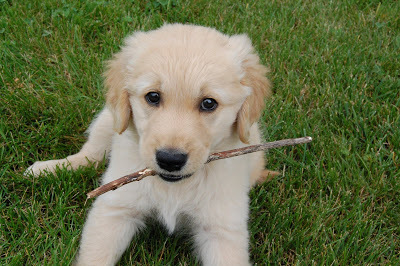 The best is when he finds a stick in the yard like this one. He is so cute when he runs around with it in his mouth! Wrigley is just too cute for words! 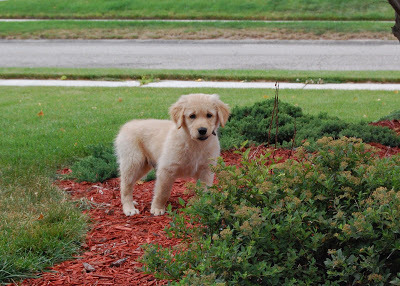 His cuteness may help you forgive him when he chews your shoes, books, clothes, furniture, etc. I can see he is getting taller in the second photo. He is adorable! I cannot even begin to count the many things Molly has chewed up. Shoes, pillows, remote control, digital camera, cellphones (yes more than one cellphone! ), fireworks, suet cakes, batteries. Other crazy things include getting into a nest of bees and going to the emergency room, just had surgery to repair her ACL and was going through physical therapy! Hopefully your dog will skip that type of craziness! She is still worth all of the trouble! Have fun with him, he is a cutie!